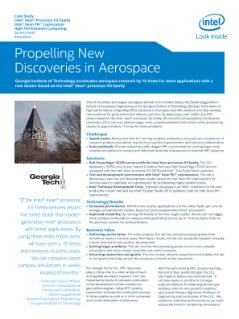 One of the oldest and largest aerospace schools in the United States, the Daniel Guggenheim School of Aerospace Engineering at the Georgia Institute of Technology (Georgia Tech) relies on high performance computing (HPC) resources to fuel basic scientific research and help develop new solutions for government and industry partners. By deploying a new 3,056-core HPC cluster based on the Intel® ...Xeon® processor E5 family, the school's Computational Combustion Laboratory (CCL) can now address larger, more complex problems than before while accelerating results by approximately 15 times for some problems. • Speed results. Reduce the time for running complex simulations to accelerate completion of research projects and deliver results more quickly to government and industry collaborators. • Scale workloads. Provide researchers with a bigger HPC environment for running larger, more complex simulations on campus and help them avoid the long queues for external HPC resources. • Dell PowerEdge* C6220 servers with the Intel Xeon processor E5 family. The CCL deployed a 3,056-core cluster named Gryphon that uses Dell PowerEdge C6220 servers equipped with the Intel Xeon processor E5-2670 and Intel® True Scale Fabric switches. • Test and development environment with Intel® Xeon Phi™ coprocessors. The lab is deploying a new test and development cluster based on Intel Xeon Phi coprocessors to uncover ways to capitalize on coprocessors for accelerating highly parallel codes. • Intel® Software Development Tools. Software developers use Intel® compilers for the new production cluster and will use Intel® Cluster Studio XE to optimize code for Intel® Xeon Phi™ coprocessors.